'Manifest Joy' (Skt. Abhirati; Tib. མངོན་པར་དགའ་བ་, Ngönpar Gawa, Wyl. mngon par dga' ba), presided over by Akṣobhya (Vajra family-East). 'The Magnificent' (Skt. Śrīmat; Tib. དཔལ་དང་ལྡན་པ་, Paldangdenpa, Wyl. dpal dang ldan pa), presided over by Ratnasambhava (Ratna family-South). 'The Blissful Realm' (Skt. Sukhāvatī; Tib. བདེ་བ་ཅན་, Dewachen; Wyl. bde ba can) or 'Lotus Mound' (Tib. 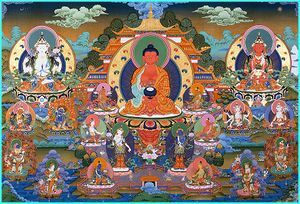 Pema Tsekpa), presided over by Amitābha (Padma family-West). 'Accomplishing Perfect Action' (Skt. Karmaprasiddhi; Tib. ལས་རབ་གྲུབ་པ་, Lerab Drubpa, Wyl. las rab grub pa) (Karma family-North), presided over by Amoghasiddhi. 'The Highest' (Skt. Akaniṣṭha; Tib. འོག་མིན་, Omin, Wyl. 'og min) or 'Blazing Mountain' (Tib. མེ་རི་འབར་བ་, Meri Barwa, Wyl. me ri 'bar ba), presided over by Vairocana (Buddha family-Centre).